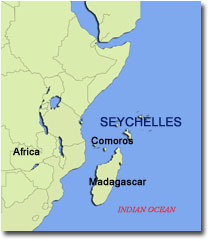 Seychelles is located in the western part of the Indian Ocean, north of Madagascar and east of Mombasa, Kenya. It is between 4 and 5 degrees south of the equator at a longitude between 55 and 56 degrees east. The legal system is based on English Common Law, French Civil Law, and Customary Law. The judicial power of Seychelles is vested in the Judiciary, consisting of the Court of Appeal, Supreme Court and other subordinate courts or tribunals established under the Constitution. The concept of the separation of powers, as defined by the Constitution, guarantees the independence of the Judiciary. The principal corporate legislation is the International Business Companies Act 1994. Standard Authorised Capital is US$1,000,000 divided into 1,000,000 shares of US$1 each. Minimum of 1 shareholder, either natural person or legal entity can be a shareholder. Minimum of 1 director, either natural person or legal entity can be a director.